The long-sought road to freedom…the bridge across the chasm…unveiled by L. Ron Hubbard himself. This landmark filmed presentation of The Bridge to Total Freedom is Mr. Hubbard's first delineation of the path an individual travels to the full recovery of his potentials. Long dreamed of but never previously achieved, here is the route to far higher levels of ability and awareness than has ever before been possible. Using state-of-the-art digital techniques, this filmed lecture has now been fully restored to perfectly replicate the moment L. Ron Hubbard originally delivered it. Experience the route to your future eternity with the Classification and Gradation filmed lecture. Digitally restored, in full color, on DVD. Man, in his religious heritage, has long imagined two plateaus of existence separated by a chasm—the lower plateau representing life in the here and now, and the higher plateau representing a far better state of existence. But without a means to cross the chasm, that higher plateau remained inaccessible. Needed was a bridge to traverse the spanning. 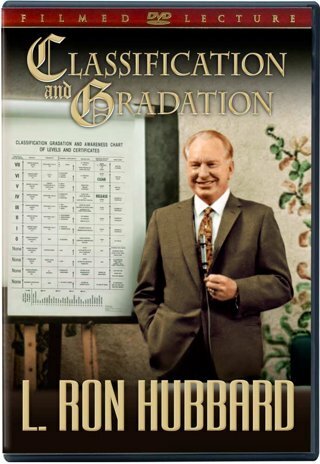 L. Ron Hubbard built that bridge with Dianetics and Scientology and on September 9, 1965, in a historic filmed lecture, he introduced it to the world: The Classification, Gradation and Awareness Chart of Levels and Certificates. It marked the culmination of more than thirty years of research and provided the delineation of the precise step-by-step route by which one ascends to increasingly greater awareness, ability and spiritual freedom. Through the ensuing years, Mr. Hubbard streamlined the route with new rundowns and higher levels. But the purpose, theory and pattern remained the same and will never change. This landmark lecture is now fully restored to perfectly replicate the moment L. Ron Hubbard originally delivered it. Here, then, is both the foundation of The Bridge to Total Freedom and the story of exploration that made its construction possible.